Jaideep Hardikar writes from the gold fever in India. Indians love gold. They have had gold fever for millions of years. India has no goldmines but they have sold everything to get gold: pepper and spices, cloth and knowledge. Kings and queens bought gold. They fought many wars to get more gold. Today all important rituals in India use gold. At weddings, to celebrate the birth of children, or even at the end of life – gold is very important. For many festivals, people need to buy gold to bring good luck. Film and folk songs say India is ‘a golden bird’. Everyone loves gold: the rich, the poor, every caste, class and religion. On 9 April this year, a team of Indian surgeons operated on a 63-year-old patient. He had very bad abdominal pain. The doctors took 12 bars of gold out of his stomach. He had risked his life to get this gold into India without paying tax. The gold bars went to the government and the man went to prison. There are many other stories like this. There has been more gold smuggling in the last two years, like in the 1980s, because the government tripled the import tax in 2012-13 (to 15 per cent). This was to try to stop so many imports. So there was a little less gold imported, but much more smuggling. In April 2014, India’s former finance minister Palaniappan Chidambaram said that 3,000 kilograms of gold was smuggled every month. This was $10 billion of gold, or more. People – like the 63-year-old man – use a lot of different, creative ways of bringing gold in the country. Sometimes they stuff dates with melted gold. Or they grind gold into tiny bits and mix it with other metals to look like ore. Or they make it into gold belt buckles and flashlight batteries. The government and the Reserve Bank agree that gold is now India’s biggest economic problem. But they find it impossible to change laws and stop people wanting it so much. Today India is the world’s second-largest importer of gold after China. Nearly 20 per cent of the gold in the world crosses the border every year. This takes away important dollars. So they have a big problem with balance of payments, and the money cannot be used in the economy. India is importing too much gold: 700 metric tons in 2010 and 975 in 2013. And so many more tons of gold have been kept by Indian families for so many years. And that’s not all. Gold funds on India’s two stock exchanges are also doing very well. In ten years, a lot more gold was imported – from 8.1(in 2001) to 9.6 per cent(in 2011) of India’s imports, just behind oil products. In ‘India’s Gold Rush: Its Impact and Sustainability’, it says that more money was spent on importing gold (between 2005 and 2012) than all the money spent on urban development, health, education, housing and family welfare. So all the money used to buy gold could have helped educate, house and feed all the poor in India. And it is not clear if the government want this. They try to reduce the money going out, but they also cancel $9 to $11 billion of tax on gold imports every year. Who benefits from these tax cuts? And who loses? 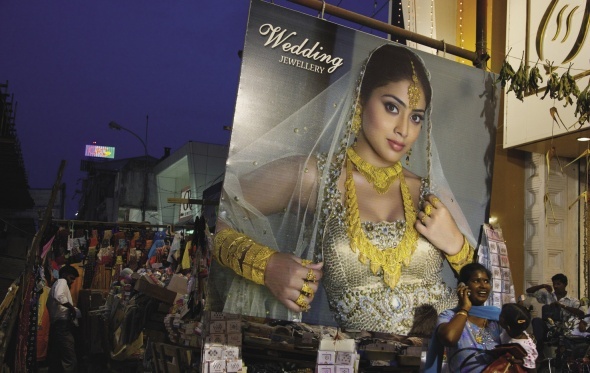 Many economists say gold imports show that inequality is growing in India. In the last few years, the two different Indias (urban and rural) have used gold in very different ways. Urban India buys so much gold to store money. And rural India sells small amounts of gold to get money and pay for farming and survival. The rich India makes the Current Account Deficit worse; and this then destroys the poor India. Imports get more expensive. The rupee loses value and the dollar gains value. The rich get richer and the poor get poorer. But who is causing this mad fight for gold? The World Gold Council estimates 75 per cent of gold demand in India in the last 10 years came from jewellery – mostly bought by the small group of very rich. The Council say half of the gold every year is for weddings. A lot of this is for the dowry. In the next 10 years, because more than half the population is under 25, there will probably be 15 million weddings in India each year. India’s needs more gold than exists on the market; they want more gold all the time, even after a 400-per-cent rise in the rupee price in the last decade. The other big reason many Indians invest in gold is that most of them are still too poor to use banks. More than half the 1.25 billion people in the country have no bank accounts at all. So they cannot formally borrow or save. Many people believe they need to buy gold to save. But the gold is not reliable. They have to sell at a very cheap price to local jewellers when they need things. For example, Swapnil Shirke, a 24-year-old cotton farmer from Vidarbha. He could not get out of the terrible debt that so many rural families are in. On 23 November 2012, in the Indian festivities, he sold his mother Ashabai’s 25-gram gold mangalsutra (a traditional gold chain that married women wear) to get a little money. With this he paid his farm workers, and kept some money to pay his younger brother’s college. Then he hanged himself. In that same November when Swapnil died, rich Indians spent several million dollars on 50 tons of gold, mostly jewellery. The gold chain he sold was his mother’s last memory of his late father. It was also the family’s last money. Jaideep Hardikar is a journalist from Nagpur, Maharashtra. This page was last edited on 29 September 2014, at 21:46.